Learn how to cook quinoa (pronounced keen-wah) which is not technically a true grain so I am separating quinoa from the other grains. It is my opinion that this one stands alone by its own rights. It is an amazing wonder food! The origin of this ancient food comes from the Andean region of South America which is where I learned how to cook quinoa. It has been a staple food along with corn and potatoes for 6000 years. The Incas held the crop to be sacred and referred to it as “the mother of all grains”. The local Inca emperor would traditionally sow the first seeds. 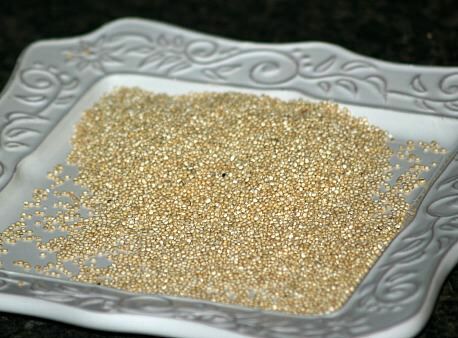 Quinoa has become highly appreciated for its nutritional value, as its protein content is very high (12% to 18%). It is a healthy choice for many vegetarians and learning how to cook quinoa is simple. Four ounces, about ½ cup will provide a child with enough protein for a day. It is also very high in calcium, magnesium, and iron, and a relatively good source of vitamin E and the B vitamins. It is gluten free and unlike other grains, Quinoa contains a balance set of amino acids for humans. It is a good food for dietary fiber and phosphorus. When you purchase quinoa, check to see if it has been prewashed. If not it will need to be washed before using. The coating on the whole grains leave a bitter taste if not washed thoroughly. It is a simple procedure and in many dishes can be used while still wet. If grinding into flour it needs to dry out thoroughly before grinding. I started learning how to cook quinoa several years ago. I have tried it in many casserole recipes and many dessert recipes. All have turned out delicious! As a whole grain, you can substitute it for rice. Because of the high protein in quinoa you do not need meat in this broccoli casserole recipe to get protein. Combine all ingredients in a greased casserole baking dish and bake for 1 hour or until quinoa is tender and broth has been absorbed. Wash quinoa in cold water; drain in mesh strainer for a few minutes. Bring 4 ½ cups water to a boil in medium saucepan; add 1 teaspoon salt and quinoa. Cover pan, REDUCE HEAT to low and cook 15 minutes; set aside. TO PREPARE LEMONGRASS cut off bottom third of stalk; remove tough outer leaves. With a sharp knife cut into thin slices and mince remaining lemongrass. NOTE: Tough parts are good to cook in soup stock. Heat oil in a large skillet; add and stir in the ginger and garlic for 2 minutes. Add minced lemongrass, ground ginger, black pepper, ground cloves and tofu. Stir mixture adding enough salt to taste; stir fry over medium high heat for 3 minutes. Add broccoli and REMAINING ¼ cup of water; cover and let steam over LOW for 5 minutes. Add quinoa and red pepper and quinoa to skillet; add more salt to taste if needed. Stir mixture until hot and serve; serves 4. Wash quinoa in cold water thoroughly; drain well in mesh strainer. Bring stock to a boil in medium size saucepan; stir in quinoa and return to boil. REDUCE HEAT, cover and simmer for 25 minutes or until liquid is absorbed. Add to bowl the onion, pepper cucumber and herbs. In a small bowl combine orange juice, vinegar, peel, salt and pepper. Whisk oil into the orange mixture; pour over quinoa mixture and toss well. Serve on lettuce leaves and top with pecans; serves 6 side dishes.